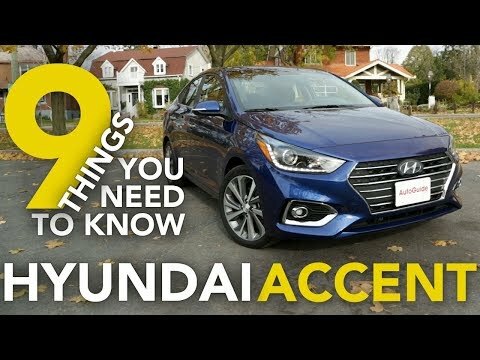 The 2018 Accent is Hyundai's least expensive car, a subcompact sedan that competes with rivals like the Honda Fit, Toyota Yaris, Ford Fiesta and Chevrolet Sonic. The Hyundai Accent is all-new for 2018, and for its 5th-generation revamp gains upscale looks, key technology like Apple CarPlay and Android Auto integration, more safety features and slightly improved fuel economy. Add a Hyundai to Accent your life. The warranty is amazing! Gas mileage is amazing! I have only owned it 6 months but so far so love! Hyundai is a great company too. They communicate well and keep you posted on updates and services. The back up camera is convenient and I love the phone automatically linking to the car. I have not found anything I don't like so far. Cannot wait to own it for many years to come. Very reliable, but lacking some features that are important to me. My car is pretty basic. It does not have all the bells and whistles of a decked out version. But it drives well. I would like better mileage but it is still better than a larger vehicle. I have had no issues with it. I would complain about it not having a CD player because I have a lot of CD's and now I cannot listen to them and not all of my music is available on Spotify. It had great gas mileage and was everything I was looking for! When I was looking for a car I was looking for an affordable car that I can take to and from work. I was also looking for great gas mileage since I travel a up and down a mountain to get to work. The o my problem is there is no leg room in the back seat, but that does not truly matter much because the front seats are adjustable and I rarely have someone in the back seat.